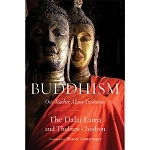 This ebook combines well-chosen essential teachings by the Tibetan masters Lama Thubten Yeshe and Lama Zopa Rinpoche supplemented with teachings by American nun, Ven. 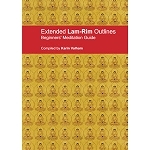 Amy Miller, to provide a wonderful overview of many of the key points of the path to enlightenment (lamrim). Each of these sections in this title concludes with a meditation on the subject. 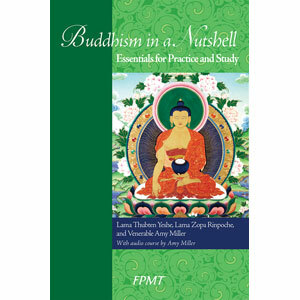 Included with this eBook is complimentary access to the online version of Buddhism in a Nutshell, which is available on the FPMT Online Learning Center. This FPMT introductory course consists of 11 hours of clear and accessible teachings and guided meditations by Ven. Amy Miller. These teachings are intended for people encountering Buddhism for the first time, as well as for people who are already familiar with Buddha’s teachings but would like a more structured approach to understanding the whole path to enlightenment. They cover the life of Shakyamuni Buddha,the four noble truths, and the stages of the path to enlightenment (lamrim) based on an explanation of the short poem Foundation of All Good Qualities by Lama Tsongkhapa. In addition, the online course includes transcripts of Ven. Amy Miller’s teachings and meditations together with other online resources, such as points for reflection to help course participants think about the teachings in relation to their own lives. A discussion forum allows course participants to interact with each other and the course elder. A Certificate of Achievement is available to participants who complete all the course requirements. 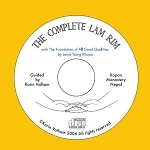 Together the book and the online course provide a comprehensive overview of Buddhism as taught and practiced in the Tibetan Mahayana tradition of Lama Tsongkhapa (Gelug). The teachings by Lama Thubten Yeshe and Lama Zopa Rinpoche are a must-read for all of their disciples. Note: After purchasing this product an email will be sent that allows you to download the title in the two formats of mobi and epub. For an explanation of eBook formats and how they work, click here. Click here for hardcopy version.